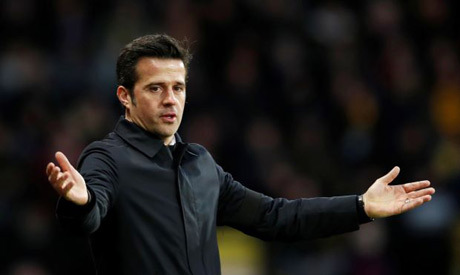 Everton manager Marco Silva said he is concerned by their poor form after they were beaten 1-0 at former club Watford on Saturday for their third straight Premier League defeat. Coming into the game on the back of losses to Wolverhampton Wanderers and Manchester City, Everton failed to take their chances as Andre Gray's second-half strike sealed all three points for the hosts. "It's not good for us as a club, and for me as a manager it's not good," Silva told reporters. "I'm concerned but we have to work more and more to achieve the results that can grow our confidence." Everton's majority shareholder Farhad Moshiri said last month Silva was the right person to guide them in the long run as they move ahead with plans for a new stadium.